Yesterday was quite a whirlwind. 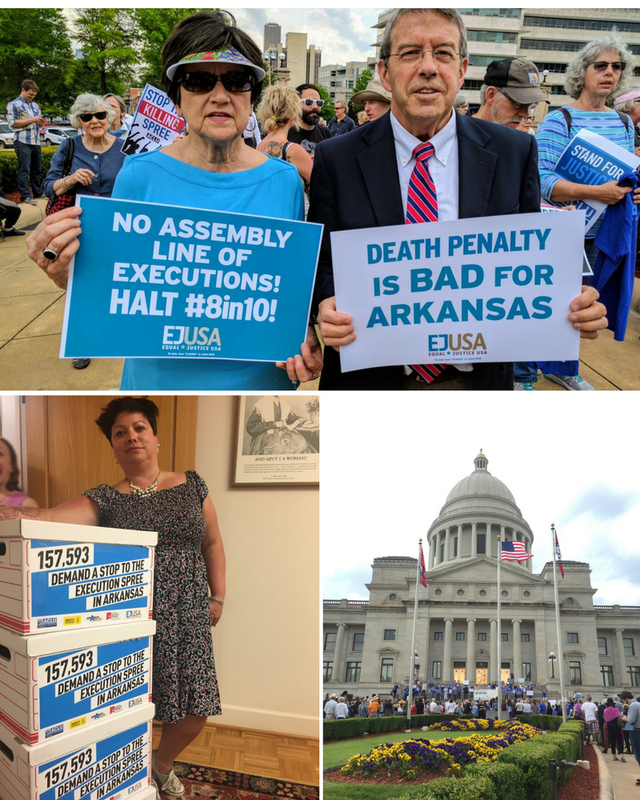 The day started early with preparations for the rally and petition delivery at the Arkansas State Capitol and ended late in the evening with the announcement that all of the scheduled #8in10 executions had been put on hold. I spent the morning with our coalition partners, preparing over 150,000 petition signatures for delivery. (Did you know that it takes over 10,000 pieces of paper to print out over 150,000 signatures?) Then we gathered – in fellowship and in a show of strength – on the stairs of the Arkansas Capitol, proclaiming that the death penalty is broken and needs to end. I was there with our coalition partners and hundreds of Arkansans, including community, religious, and civil rights leaders. Johnny Depp was there with his friend Damien Echols of the West Memphis 3, who spent 18 years wrongfully convicted on Arkansas death row. And thousands more of you were there in spirit, your signatures on the petitions waiting to be delivered inside. Shortly after we delivered the boxes of petitions to the Governor’s office, we heard news that one of Monday’s two executions had been put on hold – #8in10 was now #6in10. (Another of the 8 originally-scheduled executions had been stayed earlier this month.) Then, just over an hour later, a judge issued a restraining order on the state’s use of one of the execution drugs because the drug company claimed it was never meant to be sold for use in executions. This effectively put all of the Arkansas executions on hold. Early this morning, another judge also issued stays on all executions after several days of hearings with lawyers representing the men on death row. The judge ruled that Arkansas’s lethal injection procedure left the men facing execution without enough access to their attorneys. The State has appealed these decisions, and arguments will go on throughout the weekend, potentially all the way up to the U.S. Supreme Court. We will try to post the latest news on our Facebook and Twitter feeds, so stay tuned. And thank you for all you are doing to help end the assembly line of executions in Arkansas!